Our goal is for every traffic stop to end safely for all involved. To achieve this goal, we have taken various steps, all of which have been directed at law enforcement: All police officers in New Jersey must complete annual training on de-escalation techniques, cultural awareness and implicit bias through our CLEAR Institute; thousands of police officers now wear body-worn cameras; we have improved protocols for investigation of police-involved use of deadly force; and we have promoted innovative community policing through hundreds of thousands of dollars in grants and awards. Our new “Safe Stop” initiative takes the next step by providing information for the general public about what to do, and what not to do, during a traffic stop, to ensure that all stops are safe and fair. Please help us make every stop a Safe Stop. 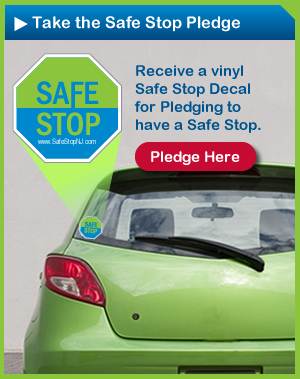 Take the Safe Stop Pledge and we'll send you a Safe Stop decal to display on your vehicle. 1. While the police officer is getting out of the police vehicle and approaching my vehicle, should I reach for my license and registration to have it ready to present, or is it better to wait until I’ve been asked to produce it? The safest practice for both the officer and the vehicle occupant(s) is to wait until the officer approaches your vehicle and requests your credentials (license, registration, and proof of insurance) before you produce them. When the officer requests these documents, you should tell the officer where you are retrieving them from before you reach for the items. 2. Once I have provided the necessary identification and information to the officer during a motor vehicle stop, do I have the right to then remain silent? Yes. Drivers and passengers do not have to answer any additional questions once proper documentation has been provided to the officer. However, vehicle occupants are still required to follow the officer’s instructions. 3. Can I request that a supervisor come to the scene of the police stop? Any person stopped by an officer during a motor vehicle stop can request that a supervisor come to the scene. However, due to patrol operations, such as the number of supervisors on duty and their location, a supervisor may not be immediately available. In that case, the motorist should follow the instructions of the officer present at the scene and follow up with a supervisor after the stop has been completed with any concerns. 4. Can I ask why I am being stopped? Most often, once an officer approaches the vehicle, the officer will immediately request the driver’s credentials (license, registration and proof of insurance). The driver should first present his or her credentials to the officer(s). Once the credentials are provided, motorists are free to inquire about the reason(s) for the stop. 5. Can I use my cellphone to video tape the stop? Can my passenger? A driver and/or passenger(s) may use a cell phone to record a stop as long as it does not interfere with following the officer’s instructions. For example, if the officer asks to see the hands of all occupants of the car, they should put the phone down and display both hands. 6. Can I ask for the officer’s name and badge number? Yes. An officer is required to provide his or her name and badge number when requested. 7. What training do police officers receive to prepare them to make safe and lawful stops? All police officers in New Jersey receive training on traffic laws, on the Constitutional rights of all civilians, and on legal and appropriate uses of force. Additionally, under Attorney General Directive 2016-5, every police officer now must complete annual training on de-escalation, cultural awareness, mental health, and implicit bias, among other topics. 8. Are traffic stops recorded on video? Nearly every marked police car in New Jersey is now equipped with a dashboard-mounted camera, and those cameras must be activated during traffic stops. Additionally, many police officers now utilize body-worn cameras, which are required to be activated during traffic stops. 9. How do I file a complaint against a NJ State Trooper? There are several ways a person may file a complaint against an officer. For stops made by New Jersey State Troopers, the driver and/or passenger(s) may request a complaint form at the scene which can be filled out and filed in person, sent in writing via mail or email, or made via telephone to the New Jersey Office of Professional Standards. The Compliment/Complaint procedure for New Jersey State Police can be found at www.njsp.org/information/complaint.shtml. 10. How do I file a complaint against a local police officer or department? You may visit the police station of the officer’s assigned municipality in person to file an internal affairs complaint. Each police department is required to have a person available to help with the process of filing a complaint, regardless of the hour or day of the week. You will not be turned away or told to come back. You may file a complaint with the applicable municipality over the phone or in writing (by letter or e-mail). A complaint may be filed anonymously. You do not need to provide your name or contact information to file a complaint. Someone else may file the complaint on your behalf. A person who is in jail or prison may also file an internal affairs complaint. They can either file one over the phone or in writing, or ask someone else to file it on their behalf. 11. Does every police agency have an internal affairs unit? Yes. Per the Attorney General’s Guidelines, every law enforcement agency must establish, by written policy, an internal affairs unit to investigate allegations of misconduct by officers. 12. If I have an internal affairs complaint, do the police need to take it? Yes. Every police department in the State is required to accept reports or complaints about an officer or employee of a police agency. Complaints must be accepted regardless of the complaining party’s age, race, ethnicity, religion, gender, sexual orientation or identity, or immigration status. 13. How long does it take to investigate an internal affairs complaint? 14. Are the police required to let me know the results of the investigation? Yes, if you provide your name and contact information. If the allegation was unfounded or the officer was exonerated, this conclusion will be stated and defined for the complainant. If the allegation was not sustained, you will be provided with a brief explanation as to why the complaint was not sustained (e.g., insufficient proof, lack of witnesses, etc.). If the allegation was sustained and discipline was imposed, you will be given this information and advised that the officer has been disciplined according to department procedures. 15. What can happen to a law enforcement officer if he or she is found to have committed misconduct? The punishment can range from an oral or written reprimand for minor administrative offenses to suspension, demotion, or firing for more serious administrative offenses. If the conduct rises to the level of a crime, the officer may face criminal prosecution. 16. Is there any public release of internal affairs information? Each police department is required periodically to release reports to the public summarizing the number of allegations received, investigations completed, and cases where a suspension of more than 10 days was imposed. The specific discipline imposed in any specific case is a personnel matter, and therefore confidential. 17. Will my name or the name of the officer be released to the public? 18. What can I do if I do not agree with an internal affairs decision or I never receive a decision? If you disagree with the result of an internal affairs investigation by New Jersey State Police, or do not receive a decision, you can call the New Jersey Office of Professional Standards at its toll free recorded hot line 877-253-4125 to speak to a representative Monday through Friday between 9:00 am and 5:00 pm. You may also contact The Office of Law Enforcement Professional Standards (OLEPS) at 609-341-3228 if you disagree with the outcome of a State Police internal affairs investigation. The OAG representative will ask whether you have contacted the local internal affairs department or the County Prosecutor about your concerns. If the answer is no, you will be directed to complete steps b and c above before OAG will process your inquiry. You will be asked to send your concerns and supporting documentation, if applicable, to OAG in writing via email or United States Postal Service. Each written inquiry is then logged into OAG’s tracking system and directed to the appropriate Division for action and follow up. The assigned Division is responsible for sending you an acknowledgement of receipt of your inquiry, as well as providing you with a response to your concern once its review has been completed.